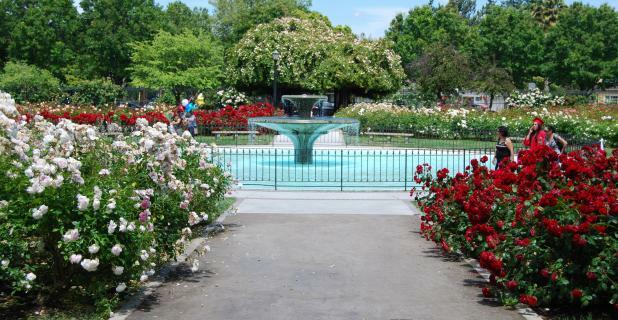 The San Jose Municipal Rose Garden 5 1/2-acre located at , San Jose, California. It was a prune orchard. After that it was bought by san jose in 1927 and then converted into rose garden. There are 189 rose varieties having more than 3,500 shrubs. From April to November more than 4,000 colorful roses are in bloom . In May rose garden is at its peak. By All American Rose Selection (AARS) It is voted as "America's Best Rose Garden" On August 12, 2010.because of its beauty, creativity and community involvement. In year 2008 more than 800 new roses were planted as part of the restoration project. For the wedding ceremonies there are also two sites the Fountain Arbor and the Rose Garden Stage. In Jose Municipal Rose Garden There are wide colors of rose flowers from palest pinks to the deepest reds. There are also some varieties of roses which are over 100 years old. It is a natural air resource with zero pollution. The fountain in the center of garden enhance its beauty. It is very peaceful and aromatic place. There is also open grass area to play and sit.